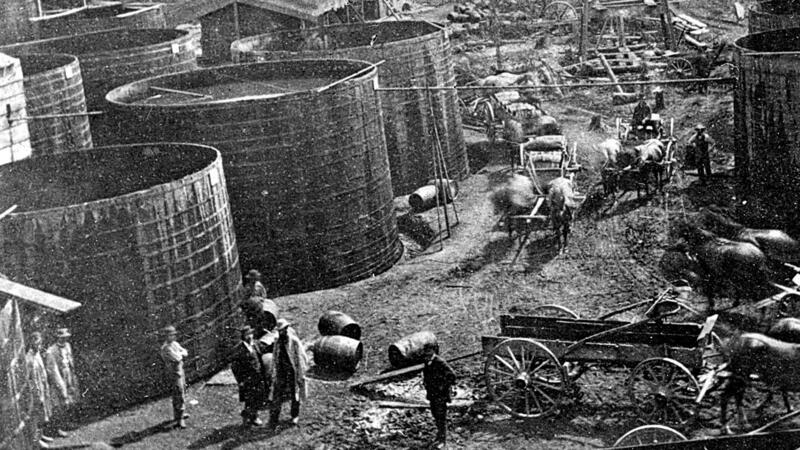 Tanks holding oil in Pithole, Pa., in 1868. Samuel Van Syckel built his first pipeline over just five weeks in 1865. At 2 inches in diameter, it was tiny by modern standards — but it was an engineering marvel. Miller Farm, the terminus of Van Syckel's pipeline, in 1868. 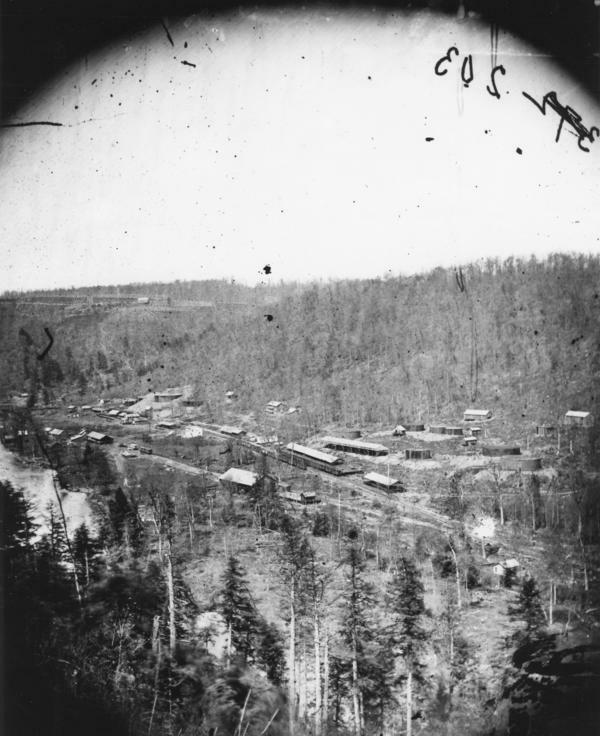 The oil was pumped to Miller Farm and then transported by railroad. Before Van Syckel's pipeline, transporting oil cost as much as, or more than, the oil itself. He eventually lost his pipeline to the bank after making several unwise bets. In January 1865, the place where this all happened, called Pithole, was nowhere, really — just a patch of wilderness in the foothills of the Appalachian Mountains. Then drillers struck gushers at three wells and everything changed. By September, an estimated 15,000 people moved to Pithole. And soon, Van Syckel had constructed his 5 1/2-mile pipeline. Walking the snowy grounds of what used to be Pithole City, Sue Beates, curator of the nearby Drake Well Museum, points out the sites where old Methodist and Presbyterian churches once stood. But there was more to Pithole than religious devotion, she explains. "There were hotels, a jewelry store, drug stores, houses of ill repute, lots of saloons, parlor dens of all sorts, billiard parlor dens — that sort of thing." Van Syckel had come to the region as an oil buyer, a middleman. Like everyone else, he was there to make his fortune. But there was a big obstacle to the Pithole boom. "Once people were there, they discovered it was one thing to bring oil out of the ground — but it was an entirely different thing to try and get it to market," says Christopher Jones, a historian at Arizona State University. "The main way oil was transported during the first several years of the industry was by teamsters," he says. But this was long before the labor union by the same name. "These were men driving wagons pulled by horses, and they would collect the oil in large barrels — 300-pound barrels of oil — that they would load up on their wagons, and drag them over the various roads," Jones says. Roads filled with up to two feet of mud, Beates notes. The work was incredibly tough, but the teamsters made it pay. "They definitely had a monopoly on it," Beates says. "Oil was selling for maybe $5 a barrel, [$3] of which went to the teamsters." So the cost of moving the oil was as much as, or more than, the oil itself. Van Syckel saw an opportunity. "He had a mechanical aptitude and a vision for doing things that exceeded most of the other people who went there," Jones says. 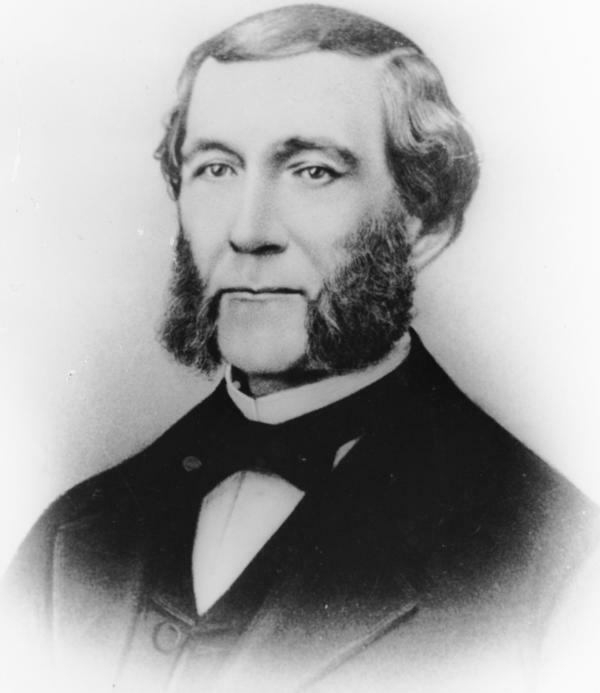 By the summer of 1865, Van Syckel had raised $100,000 from a bank. Within five short weeks, he had built the nation's first pipeline. Or to be more exact, the first oil pipeline that "didn't leak like a sieve," Beates adds. Van Syckel's pipeline was wrought iron and 2 inches in diameter. That's tiny by today's standards, but it was an engineering marvel. One challenge, Jones says, was preventing ruptures. "Making sure that the joints were securely enough welded that, even with the pressure to push the oil through the pipelines, that that pressure didn't split the pipes apart and ruin the pipeline," he says. The topography along the route was also a challenge, Beates says. "You can see the steep hills that it had to go over, which is why there were steam pumps to help push the oil up over the hills," she says. "Then it could gravity feed down the next [hill] and then steam-pump-pushed back up the next hill all the way to Miller Farm, to the railroad." The engineering worked fine. But the teamsters — those rugged guys who hauled wooden barrels of oil with teams of horses — weren't too happy with Van Syckel's pipeline. "So as soon as the pipeline was completed, several of the teamsters in the middle of the night went to various sections of the 5-mile pipeline and ripped it out of the ground and pulled the pipe apart so it stopped working," Jones says. Beates adds, "They took pickaxes and horses and chains and pulled the pipe apart." There were threats and fistfights, but Van Syckel rebuilt his pipeline. And this time, he enlisted the sheriff and his own security team. "By hiring his own armed force to patrol the line, he ended up defeating the teamsters — and they stopped trying to sabotage his line," Jones explains. And just like that, a new technology would make an entire line of work obsolete. "It's estimated that 500 teamsters were put out of business in five weeks," Beates says. Within a couple of years, she says, hundreds of pipelines crisscrossed western Pennsylvania, the birthplace of the American oil industry. "Wherever there was a big oil strike, there would be a pipeline to transport the oil to a railroad," Beates says. And what about Van Syckel? After making some unwise bets, Jones says, he lost his pipeline to the bank. Later, the ingenious Van Syckel developed some new methods of refining oil. But within a decade, someone else would emerge to dominate refining, pipelines, rail shipments — almost the entire oil industry. His name was John D. Rockefeller. Now a battle that makes the debate over the Keystone XL pipeline look tame by comparison. You have to go back 150 years - that's when Samuel Van Syckel built an oil pipeline across the rugged terrain of Northwestern Pennsylvania. It transformed how oil is transported and it changed the modern world. NPR's Uri Berliner has the rest of this story. URI BERLINER, BYLINE: The place where all this happened is called Pithole. In January 1865, Pithole was really nowhere, just a patch of wilderness in the foothills of the Appalachian Mountains. Then drillers struck gushers at three wells and everything changed. SUE BATES: By September, it was estimated that 15,000 people had moved here. BERLINER: That's Sue Bates, the curator of the nearby Drake Well Museum. We're walking the snowy grounds of what used to be Pithole City. BATES: Right over there is with the Methodist Church used to be and on the other side of that was a Presbyterian Church. BERLINER: But there was more to Pithole than religious devotion. BATES: There were hotels, a jewelry store, drugstores, houses of ill repute, lots of saloons, parlor dens of all sorts - billiard parlor dens - that sort of thing. BERLINER: Van Syckel had come to the region as an oil buyer, a middleman. Like everyone else, he was there to make his fortune, but there was a big obstacle to the Pithole boom. CHRISTOPHER JONES: Once people were there, they discovered it was one thing to bring oil out of the ground, but it was an entirely different thing to try and get it to market. BERLINER: Christopher Jones is a historian at Arizona State University. JONES: The main way oil was transported during the first several years of the industry was by teamsters. BERLINER: Teamsters - this was long before the labor union by the same name. JONES: These were men driving wagons pulled by horses and they would collect the oil in large barrels - 300-pound barrels of oil - that they would load up on their wagons and drag them over the various roads. BATES: Roads filled with up to 24 inches of mud. BERLINER: The work was incredibly tough, but the teamsters made a pay. BATES: They definitely had a monopoly on it. Oil was selling for maybe $5 a barrel, three of which went to the teamsters. BERLINER: So the cost of moving the oil was as much or more than the oil itself. Samuel Van Syckel saw an opportunity. JONES: He had a mechanical aptitude and a vision for new ways of doing things that exceeded most of the other people who went there. JONES: Builds the world's first pipeline. BATES: Didn't leak like a sieve. BERLINER: Van Syckel's pipeline was wrought iron and two inches in diameter - tiny by today's standards - but it was an engineering marvel. One challenge was preventing ruptures. JONES: Making sure that the joints were securely enough welded that even with the pressure to push the oil through the pipelines that that pressure didn't split the pipes apart and ruin the pipeline. BERLINER: Another challenge - the topography along the five-and-a-half mile route. BATES: You can see the steep hills that it had to go over, which is why they were steam pumps to help push the oil up over the hills. Then it could gravity feed down the next and then steam pump pushed back up the next hill all the way to Miller Farm to the railroad. BERLINER: The engineering worked fine, but remember the teamsters - those rugged guys who hauled wooden barrels of oil with teams of horses. They weren't too happy with Van Syckel's pipeline. JONES: And so as soon as the pipeline was completed, several of the teamsters in the middle of the night went to various sections of the five-mile pipeline and ripped it out of the ground and pulled the pipe apart so it stopped working. BATES: They dug it up. They took pickaxes and horses and chains and pulled the pipe apart. BERLINER: There were threats and fistfights, but Van Syckel rebuilt his pipeline, and this time he enlisted the sheriff and his own security team. JONES: By hiring his own armed force to patrol the line, he ended up defeating the teamsters, and they stopped trying to sabotage his line. BERLINER: And just like that, a new technology would make an entire line of work obsolete. BATES: It's estimated that 500 teamsters were put out of business in five weeks. BERLINER: Bates says within a couple of years, hundreds of pipelines crisscrossed Western Pennsylvania, the birthplace of the American oil industry. BATES: Wherever there was a big oil strike, there would be a pipeline to transport the oil to a railroad. BERLINER: And what about Samuel Van Syckel? Jones says after making some unwise bets, he lost his pipeline to the bank. Later, the ingenious Van Syckel develops some new methods of refining oil. But within a decade someone else would emerge to dominate refining, pipelines, rail shipments, almost the entire oil industry. His name was John D. Rockefeller. Uri Berliner, NPR News. Transcript provided by NPR, Copyright NPR.